Get tough stains out of fabrics with the help of this Arm & Hammer 61.25 oz. plus OxiClean liquid laundry detergent. Perfect for heavily-soiled loads, this detergent works in any type of washing machine to remove the toughest stains and odors without the need to use extra laundry boosters. While its light, pleasant scent leaves items smelling fresh, its new and improved formula cleans over 101 types of stains for extreme versatility. This detergent contains powerful stain fighting agents that help to remove stubborn soils. For best results, wet the desired fabric and apply the detergent directly to any stains. Rub the stain gently and allow it to soak for 5 to 10 minutes before washing. Coming with a convenient, built-in spout for mess-free pouring, this laundry detergent is the ideal way to clean linens used in hotels and restaurants. What a great combination. Arm and Hammer Liquid Laundry Detergent combined with the stain fighting power of OxiClean. It doesn't get much better than this. Your laundry will come out looking whiter and brighter than even with this dynamic duo. This is TWO terrific products IN ONE! 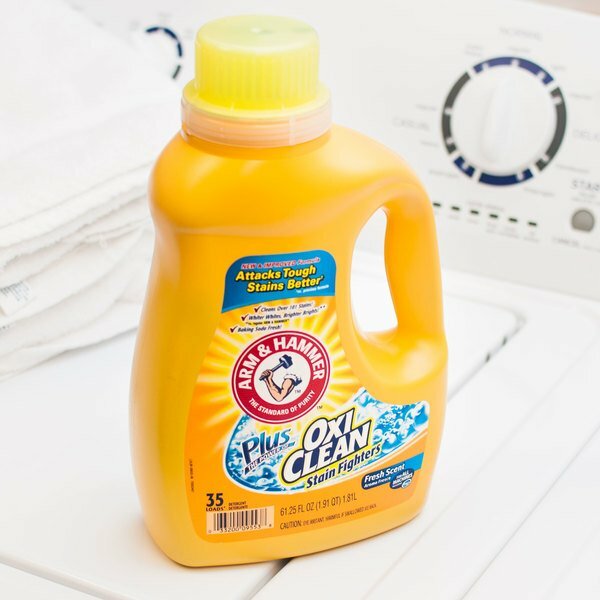 Arm & Hammer Liquid Laundry Detergent combines with the stain fighting power of OxiClean. How can you get better than that? OxiClean is tougher than any stain life can throw at you. And, Arm & Hammer keeps your laundry looking and smelling great. Together, this is one unbeatable product. 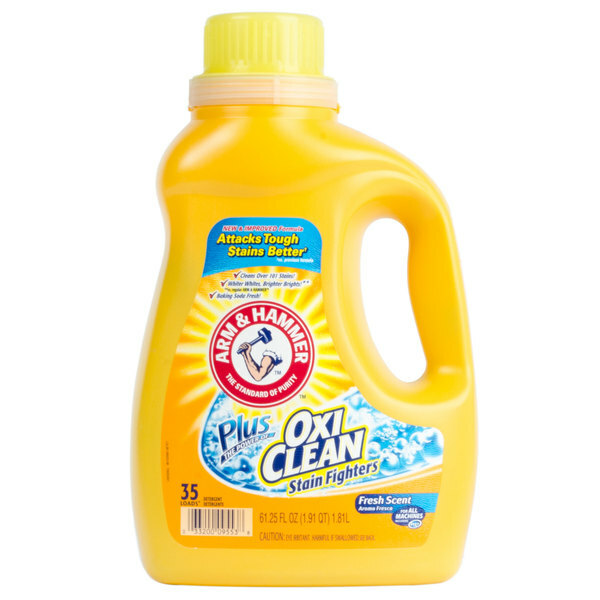 Arm & Hammer Plux OxiClean is like laundry soap on steroids. Powerful, with the stain fighting powers of OxiClean, yet great for those with sensitive skin as it is both perfume and dye free. Safe to use in all water temperatures, this liquid laundry detergent works in any type washing machine. It's easy pour spout also makes doing laundry eary. This liquid laundry detergent is great! I love how it smells and how easy the stains come out of my cloths whenever I use it. The Arm & Hammer plus oxiclean liquid laundry detergent is a great quality product and makes a great item to use for our uniforms. The detergent smells great and does a great job cleaning our clothes. I love this brand and that this gets the clothes clean without strong powerful chemicals. The liquid laundry detergent is gentle but very effective for our washing needs. Great laundry soap by arn n hammer. It works wonderfully. Tough on stains but gentke on clothes. Has oxi clean instead of bleach for added stain removal so, its gentle on colors and delicates. The arm and hammer laundry detergent liquid soap is great! Then to add the power of oxi clean to that is a double whammy! Stains dont stand a chance with this. It smells great and gets even tough stains out woth no scrubbing and no pre soak. I will be getting more of this when we run low and i definitely recommend this to others. I love and I am so happy with this detergent. It contains oxy, so that enhances the cleaning strength. The fragrance is lovely and it does linger on your clothes always having that fresh smell. I highly recommend this product!!!!!!!!! Spectacular laundry detergent that we use for EVERY load and refuse to go back to any other brand. It takes little to no extra products to remove stains as it contains ox-clean in the detergent. An excellent recommendation. I love the fresh clean scent of Arm & Hammer. Plus, I get the cleaning power of baking soda, but it's gentle as well. This bulk price is better than the club stores! 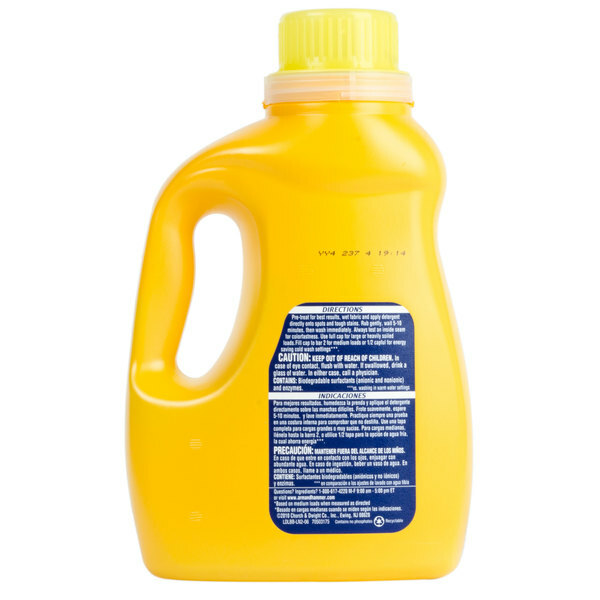 This detergent works well, and is concentrated so a little goes a long way. I use half the amount that I was using with cheaper detergents. They came packed with a sticky seal around them, so nothing leaked. The Arm & Hammer 61.25 oz. Plus OxyClean Liquid Laundry Detergent effectively cleans linens and has OxyClean as a Stain fighter. It has a great scent. I love Arm and Hammer everything! This is the first time that I have used the liquid over the pods and I am very pleased. There is enough for 35 loads! Arm & Hammer 61.25 oz. Plus OxiClean Liquid Laundry Detergent - 6/Case is an awesome product with a fresh clean scent and since it's commercial. you don't have to use as much and it's low sudsing so you can use it in HE/High Efficiency washers, great bargain too! This is a great liquid laundry detergent. This is for all machines (he). This detergent cleans well and gets most stains out without stain removal first. This detergent is great for washing kitchen towels and linen napkins after events. It has oxygen cleaning power and we typically add extra oxy clean powder when we are doing a load of heavily soiled towels. I was a little hesitant at first with this purchase as we have always used a more common name in laundry detergent. I have officially been converted. This product works so well with a great smell that i won't be getting anything else from now on. This was my first time using Arm & Hammer laundry detergent. I purchased it because of the low price and added OxiClean (which I regularly add to my laundry). I was not disappointed. This detergent works great to remove stains and the laundry has a fresh and clean scent. I have occasionally had issues with skin irritation with other brands and I have not had any issues with this detergent. I would recommend and will purchase again. This is a great laundry detergent for the price. It really gets out tough food and beverage stains like chocolate and wine and is a definite buy. Washes really well in both hot and cold although I recommend hot for table linens, etc. I swear by Arm & Hammer brand! They are the best of the best and this laundry detergent is great. This is a great price for 6. This product is a godsend. It cleans my laundry, keeping the colors bright, and the whites white. I also love the way it smells fresh and clean. We have used A&H washing detergent for many years. We have had no issues with skin irritation, clothing discoloration or anything else. It really helps that it contains OxiClean stain fighters to work on hard stained areas and bring the material clean! We wash so many clothes and this makes our job so much easier. No more lugging buggy loads of detergent around the store. No they are delivered to my doorstep with ease.